Is India's love affair with shopping malls over? These are just a few examples of malls that have either shut shop or tweaked their original glitzy plans faced with poor footfalls, low brand pull and sheer mismanagement. Numbers tell the extent of trouble. Roughly 250-300 malls came up in the country over the last two years but 70-80 per cent of the spaces in these malls lie vacant. Around the same time, as many as 40 malls have shut shop, according to Squarefeet Advisory, a mall management company. The economic slowdown has landed especially heavily on the old-line department stores that anchor many malls. As their sales and profits have tanked, they've been pulling out of malls, much to the distress of the smaller merchants who depend on the larger stores to feed them traffic. These trends are hitting the market capitalisations of most of the largest owners of retail real estate. Of course, the slowdown was the catalyst, but competition from online retailers has been the continued driver. Cushman and Wakefield estimates only 50 per cent of the scheduled malls came up in the top eight cities of India in 2012. And only 250 new ones are being planned in the next two years, while there is space for at least 2,000 malls. A clear marker for shopping centre distress. Do a thorough recce of the catchment: Ask questions like can the catchment support the development in terms of consumer footfall and spending? Is there a connect between the needs of the immediate catchment and the occupants of the mall? Are there too many malls in the catchment area? Is India's love affair with the mall over? Experts say this is not the end of the road but a time for introspection. Most malls go through cycles just like the economy: New malls get popular, then traffic begins to die down, then the mall enters a lull phase where anchor stores are leaving/being replaced or the mall simply closes altogether. Also, for many Indians, especially people under 20, the mall is their first experience with organised commercial activity, their first brush with fashion and entertainment, the first place they get their concept of style. In short, this would be the time to draw lessons from the experiences of mall owners who have been forced to change the script. The first generation malls in India were flagged off in the mid-nineties without much research or understanding of the market, say analysts. As crowds began to throng to these places, many others simply replicated the idea without a clear view of what works in the business and what doesn't. The slice-and-sell-AC-shops-within-a-big-box approach didn't work simply because it lacked planning and management and made no provision for demands emerging in the future. It may come as a surprise but "this is an industry driven by real estate, not retailing", says a consultant. The experience in India, in fact, has been similar to the US market in the early years of mall development as documented by Paco Underhill in his 2004 book The Call of the Mall: A Walking Tour Through the Crossroads of Our Shopping Culture. As he points out, the industrial appearance of the mall and its box-like stores do not express the attempts of retailers to attract customers, but the efforts of developers to squeeze the maximum profit from a construction project. While some of the smarter developers quickly altered the recipe and came back from the brink of disaster, there were others that became a case study of sorts on how not to run the business. Against this background, the biggest lesson, so to speak, has been that the mall business is like any other business. And like any other business, a thorough understanding of the consumer is the first and the most basic requirement for the business. Says Rajat Wahi, partner, KPMG India, "It is very important to look at the consumer and shopper profiles of the catchment areas before renting space to brands." This was a lesson that Delhi's Select City Walk, one of the most successful malls in the country, kept in mind while starting out. Spread over 1.3 million sq ft, which also include landscaped open spaces, the mall was designed keeping in mind the affluent female consumer used to shopping in premier South Delhi markets. The product mix was designed to offer quintessential Indian boutique brands such as Good Earth, Fab India etc alongside international labels such as Zara, Mango, Tommy hilfiger. Mind you, it is as much about the brands as it is about the ambience in the mall. "You want to have a mall where the shopping experience is enhanced and people want to keep coming back," says Wahi. Some new mall owners are creating "zones" (read, multiplexes, food courts, kids' play area) to meet the changing needs of the shoppers and upgrading services like access, parking (in terms of even lanes leading up to the malls), security, providing prams for children etc, going as far as to organise regular events around celebrity visits, shopping festivals, flea market fiestas etc to ensure footfalls and consumer involvement. The amenities draw the consumer in for reasons other than to just purchase items. Here's how Crossroads, which was acquired by retail czar Kishore Biyani from the Piramal Group of Industries for a staggering $66 million, made the transition. 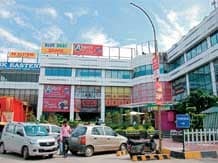 The Mumbai-based mall started floundering when the building's poor design - which allowed consumers to have a dekko at the mall's signature brand Pyramid but didn't allow them to notice other brands that were housed there too - made things difficult for a majority of the brands housed therein. Given the high tenant turnover, customer loyalty began dwindling. Rechristened Sobo Central, not only was the mall's floor layout changed to offer all brands better visibility, there was also been more emphasis on putting together the right mix of food, fun and shopping experience. Speaking of design, at Delhi's Select City Walk, the layout is such that at a quick glance, the consumer can easily read the labels/logos of 12-15 brands. The shift to a revenue share model has also proved to be a win-win for brands and mall owners. Take DLF, which moved to a revenue sharing model when many of its branded malls started faltering. The group initially gave out space on a first-come-first-serve basis besides offering shops to those who promised higher rentals. This essentially meant there was no thought given to the brand mix. What made it worse was that DLF allowed many investors to buy the shops and rent them out later. The result: no sense of ownership and low overall accountability from brands. This proved a thorny issue at the time of discussions regarding renovation or even during promotional activities. The initial euphoria of developing shopping centres has faded from the time retailers started insisting on revenue share and minimum guarantee rather than the pure rent model. With the new scenario, retailers’ ability to pay is limited by their sales. As a result, they offer rentals that they can afford, and mall developer often begin to evaluate other asset categories like offices and residential, since offices provide fixed rentals and residential comes with the inbuilt advantage of up-front cash — neither of which are available in the mall format. Such a scenario can lead to a mall closing down as a retail establishment and reinventing itself into another format. Malls must, over a period of time, evolve their tenant mix and offerings so that sales — and therefore rentals — continue to grow. In the event that a catchment does not sustain the development or there is too much completion, retailers will choose the dominant mall. When a shopping centre is not the preferred one for retailers, value retailers come in – when even value retailers cannot sustain, it is usually because of a combination of reasons. These could be: bad location, bad design, lack of adequate parking, lack of professional mall management (often the result of strata selling spaces) and a mall’s inability to find alternate usages of space. An altered revenue share approach, says Pushpa Bector, vice-president, mall head and senior vice-president, leasing, DLF's Mall of India, has allowed DLF to take a long-term view into mall management (that includes positioning, zoning, tenant mix, facility and finance management, promotions and marketing) and genuinely look into - and support - all the brands present in the malls with interesting promotions that can drive footfalls. The effort has helped: DLF Promenade has a footfall of 1 million customers per month and round-the-clock operations and better management have ensured higher loyalty among consumers. Some malls have taken the scope of mall management one step ahead - they track performance of brands, collecting data on per sq ft sales, the sales of a brand and other parameters. This helps them run a diagnostics check on the brands under the roof and figure out whether the brand is using space optimally or there is need for rationalisation. In the bargain, malls have improved yields as new brands have come in at higher revenue share deals and existing ones have delivered better performance within smaller spaces. Looking at the kind of damage poor planning brings in its wake, other malls are making sure the customer has the right brands and packaging. Inorbit Mall, which began its innings in Mumbai's Malad area in 2004, carefully took into account the catchment and decided to focus on five anchor tenants (Shoppers Stop, Lifestyle, Spencers, Fame, and Time Zone). The management routinely studies the performance of retail brands, engages with customers to gather feedback and proactively looks out for promising brands that can be a part of the property. The demand for space in malls like Select City Walk in Delhi or Inorbit Mall or High Street Phoenix in Mumbai is so high now that it has had to right size the stores of existing brands or relocate some within the premises to accommodate new ones. Select City Walk, for instance, has cut down the Levi's store from 2,700 sq ft to 800 sq ft to accommodate Superdry and Dune Shoes. Next London has shed about 1,000 sq ft of flab, helping the mall welcome Apple. Will all this be enough to bring the shoppers back to the deserted malls? Mall managers do have a lot on their plates already. Few new malls are being built, and just too many are being 'repurposed'. Because of their location, keeping in mind the spiralling real estate costs, malls are not accessible to an increasingly elderly population; technology products are taking larger bites out of customers' wallets as opposed to the traditional fare malls have to offer; online shopping has grown by leaps and bounds; and more and more women have less and less time to shop. While teenagers and young adults will continue to patronise the mall as an 'affinity centres,' to borrow a phrase from Underhill, most real estate professionals understand more profound changes are afoot.